With constant up-gradation to provide students and staff the state-of-the-art facilities, the Institute has earned a reputation for the excellence of its work across a range of computer-based disciplines. The sterling hallmark of our campus is the O-Block Computer Center. 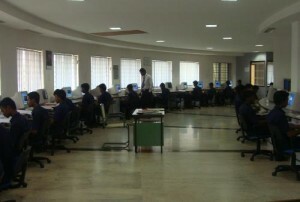 It acts as a resource centre which has been equipped with the recent software and internet facility to feed the art of computer science to our budding engineers. This centralized Computer Centre has been fully air conditioned.At a time 400 students can work individually. The system configuration is mostly Core i3 2nd Generation, Core i5 and Core 2 Duo.. Sophisticated and latest software have been purchased to enable the faculty as well as students to pursue their research / project works. Software and packages as per norms of AICTE and Anna University are loaded. Hardware peripheral facilities are available in plenty. .